On Monday I was so full of rage at my awful Worthing 10k performance my hilly Hangleton hour took under 55 minutes. Oops. Though the hills felt much easier anyway now I’ve done a month or so of them rather than none ever as for the preceding years. I think that was a very bad sentence. As was that. Also that. Anyway it felt good to be running properly and to know they is a bit of speed and endurance in there somewhere. Just need to learn how to get it out in races. I was a bit tired on Tuesday, unsurprisingly, but set out for 45 minutes, with 30 seconds fast at the end of each 5 minutes. I was quite casual and placed the 30s in roughly the eight place but took into account if I was about to cross a road etc. This may not sound like much but I’m usually quite rigid on doing what I’m told so was pleased with my newfound casualness. An interestingly different session. Wednesday was a chance to test my speed endurance (greatly lacking if Worthing 10k was anything to go by). Set my laps for a 20 minute 5k. The session was 2 x 2k, 1k of 90s recovery. Then 5 x 100 metre strides. Too slow from the off. 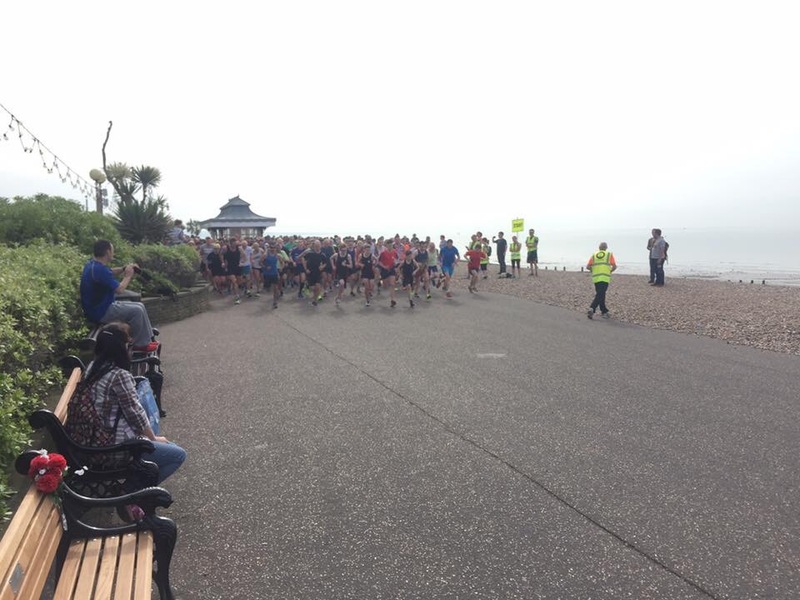 It was very hot and humid and Worthing 10k and Monday’s “race” had probably taken it out of me but naturally I decided it was just because I’m “rubbish”. Also the threat of being ejected from the track didn’t help (the woman at reception told Rob the track was shut for floodlight repairs). Cut the strides down to 5 x 10s. Not a successful session but at least I finished it (sort of). Thankfully on Thursday I felt better and ran an easy 40 minutes at a faster pace than my usual (it still felt easy though). 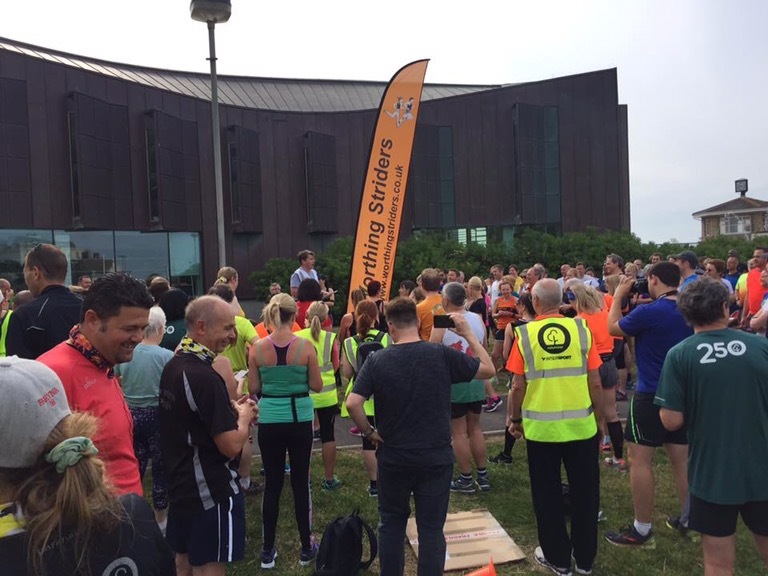 On Saturday it was time to go to Worthing (again) for the long awaited parkrun. I was determined to do the opposite of last week’s Worthing so I had planned to go out steadily and then try and ramp it up from the cone back to the finish. I stood in a sensible place on the start line and set off at what felt like a steady but not killer pace. The weather was perfect (for running sensibly). Warm and only the slightest of breezes. It was nice to go out at a sustainable pace rather than my foolish and unrealistic speed last week. I stuck to my plan and once round the cones for the 2.6k back I began to pick up the pace slowly. There was a handy lady ahead who looked like she was running a sensible, consistent pace so I caught her up slowly, stuck with her for a while, then stretched ahead of her around 400m from the finish. I had no idea of my time but guessed around 21 minutes from calculating how far I was behind Rob who had run a pb of 20.33. As the weather was so pleasant and being the first run and a small trip away from home we checked out the cafe for post run teas. It seems no one else clocked they had a roof terrace as Rob, I, Mal and Dean had it to ourselves (except for the man [with child] who kindly took our photograph). We even threw in a bit of (rubbishy inflexible) yoga after observing various classes go on around us. A proper summer’s morning. Not so today (Sunday). Wet. Cold. I went out for a quick (in time not pace) recovery jog before setting off to Hove Park for the annual Arena 80 AC races. I was the official finishing position recorder. I thought after messing it up greatly last year I’d be off the hook, but no. I had a new shouter this year, Rob. This was good though as he has a calming influence which he immediately ruined by shouting 70!!!!!!!! and scaring the living daylights out of me. Anyway I successfully recorded everyone this year. There wasn’t the utter chaos of people around 21 minutes this year thankfully so I was able to write everyone down. 36 miles for the week. A good Worthing and a thorough soaking. I have been looking out for you as I have been trying to get back to running form after my Christmas present of an achilles problem. I have done a few and did Tom’s session tonight (Hove Park) and didn’t see you. 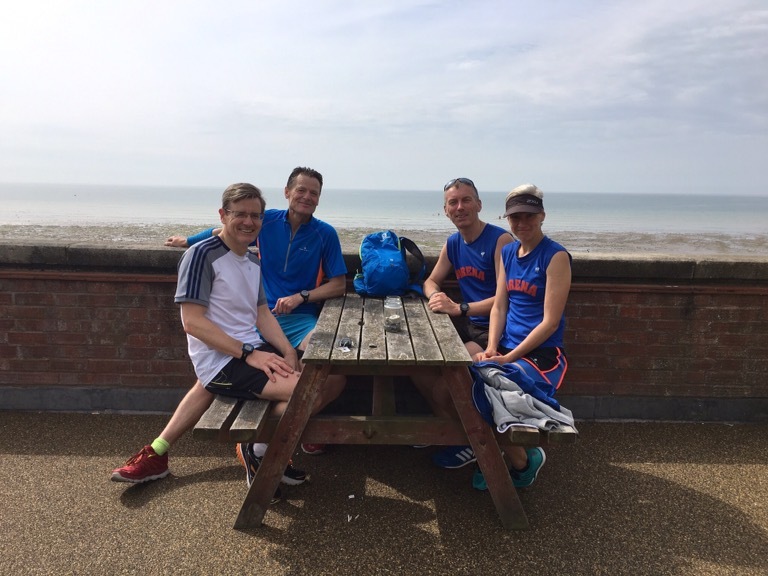 Lovely to find your blog and find out you are running. I was getting worried. Great bog (that’s how I discovered Tom’s sessions). You?! You! You,,,, keep it up. Well done. From(Firmly in a relationship, and anxious that this seems stalky) Randall, suffering from wind,many woes and my predominant sense of worth is not so much ing, more less.